My sister, Julie, handed me the book across the foot of Dad's hospital bed. She said I would love it, but it's sad. The book was "The Art Of Racing In The Rain". I didn't need sad that day in late September 2009. My Dad had just had a heart attack and quad bypass surgery. He wasn't yet on the road to recovery - and had been seeing the little green men riding bicycles around in his room. That still makes me laugh. Of course it was the pain and other drugs he was on post surgery - and he missed them when they were gone. The other reason I could not read the book just then was because my Gracie was in the car dying. She was only 9 years old and I wasn't ready for her to go. Cancer was taking her along with a host of other maladies that had crept up on us over the years. Surgery had removed the huge mass on her ribcage and a few wonderfully good weeks followed. 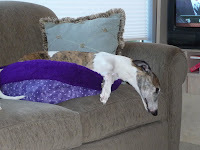 She was able to attend the 2009 NAWRA National in Roy WA that Saturday which turned out to be her very last good day. She was in the unbroken spirit class of the fun match. All decked out in her new pink collar from Debbey Bartos and shining like the diamond I knew her to be. Overnight she began going downhill - camping in a cramped Honda Element was never her idea of a good time and this was no exception. I drove her home in the morning and my roommate (Thanks Gail!) would watch her for the next day or so while I stayed at the National. The pictures taken of her in those last couple of days break my heart because I can see in her eyes - she was ready to go. A week went by and I spent it visiting my Dad in the Hospital and snuggling with my girl. We went to see our vet that Friday and she just stood there with her head hanging down. I absolutely knew I should say the words that would let her go peacefully and yet I couldn't make myself do it. Both the vet and my friend Gail sat and let me take my time - I decided to take her home with me. On Monday I knew it was no long fair to keep her here with me so I made the call and started to bawl. I cried all the way there, I cried while they prepared her and gave her a KitKat bar to hold her attention. I cried for many hours and days afterward and I know all of you know exactly what I was feeling. My first dog as an adult, my first whippet, my heart. ♥ I did not keep her ashes because that makes me feel like I wasn't letting her fly away. In my head she is in a giant pet food store eating as much as she wants forever and she will never ever get sick. I tried and tried and tried to read that book but could never get past the beginning line where Enzo was lying in his own urine when Denny came home. Nope...couldn't do it. Today is May 11th 2012 and still that book sits by my bed. I try and try...but it is forever tied to my Dad in the hospital and my Gracie's final days.